Let’s have some hand-to-hand combat! Today’s arena is the first eleven verses of chapter 15 of First Corinthians, in which Paul describes some of the historical evidence for the resurrection of Christ. Our competitors are Papyrus 46 (the earliest substantial Greek manuscript of Paul’s epistles – estimated to have been made around the year 200) and medieval minuscule 384, made (as far as can be deduced from the script) in the 1200’s. Papyrus 46 is also known as P. Chester Beatty II and P. Michigan Inv. 6238; the two names are an effect of having two parts of the manuscript residing in two collections (one at the Chester Beatty Library, and one at the University of Michigan). Let’s see which one has the better-preserved text, using the 27th edition of the Nestle-Aland Novum Testamentum Graece as the standard of comparison. To those who are new to the hand-to-hand contests (the hands in view being the hands of copyists), here’s what they involve: two manuscripts are compared to see which one has the more accurate text, on the basis of a simple count of non-original letters that are present, and of original letters that are absent; these quantities are combined to yield a total of how much corruption is present in the passage in each manuscript. Transpositions, if there are any, are mentioned, but a simple transposition is not considered a gain or loss of text. Abbreviations and sacred-name contractions are not considered variants. Readings in the text of Nestle-Aland are used as the standard of comparison even if they are bracketed. Thus, in First Corinthians 15:1-11, Papyrus 46 has 18 non-original letters, and is missing 10 original letters, yielding a total of 28 letters’ worth of corruption. In three cases, however, the difference is only itacistic (in all three cases involving the vowels in υμειν/υμιν), and in one case (αλ’ instead of αλλα in v. 10) essentially the same word is represented. With those orthographic cases set aside, Papyrus 46 has 23 letters’ worth of corruption in this passage. Also, someone has put a line of dots above the word κατέχειν in verse 8, thus conveying that it is a scribal mistake and should not be read. If we assume that the copyist himself did this, then the total amount of non-orthographic corruption in this passage is only 15 letters’ worth. Now let’s look at minuscule 384. This entire manuscript can be viewed at the British Library’s website; it is Harley MS 5588. It contains 264 pages, and contains the Greek text of Acts, the General Epistles, and the Epistles of Paul, written in black ink with red initials regular appearing at chapter-breaks. Quotations from the Old Testament are indicated by diple-marks in the margin, usually in black. Some corrections have been added in the margin (at Acts 2:17, for example), in red. Occasionally in the margin, Latin notes appear (cf. fol. 24r, for example, and 51v, near First John 5:7). In the margin of 24v, a note is written vertically in the margin of the page in what appears to be Armenian. 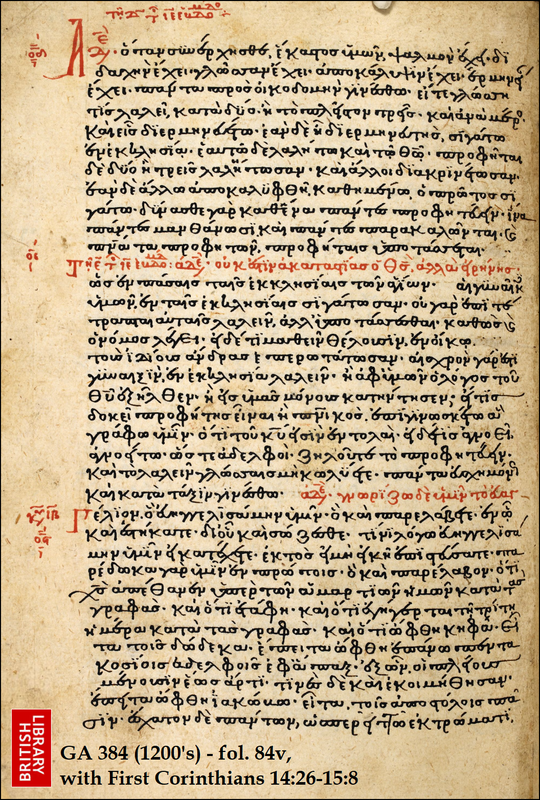 1 – 384 transposes Αδελφοι to the beginning of the verse. Compared to NA27, minuscule 384 has six non-original letters in First Corinthians 15:1-11, and is missing five original letters, yielding a total of 11 letters’ worth of corruption. The absence of the final α in αλλα is a minor orthographic variant, as is the extra tau in verse 8; if these two very minor variants are set aside, 384 has nine letters’ worth of difference from the Nestle-Aland compilation of First Corinthians 15:1-11. 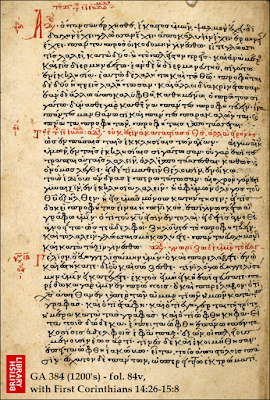 This means that if we do not assume that the removal of κατέχειν in verse 8 in Papyrus 46 was made before the manuscript was released, then the transmission-line of minuscule 384 perpetuated these eleven verses with fewer than half as much corruption as the transmission-line of Papyrus 46. This is even more impressive on the part of the copyists of minuscule 384’s text (or, unimpressive on the part of the copyists of Papyrus 46’s text) when one considers that minuscule 384’s text was handed down for over 1,100 years; in comparison, Papyrus 46’s text was only handed down for about 170 years. In this particular passage, then, in minuscule 384’s transmission-line (within the Byzantine text-stream), scribes added about one letter’s worth of corruption to these eleven verses every century, on average. Meanwhile, if P46 is assigned to the year 225, and if we assume that the copyist corrected verse 8 before finishing the manuscript, and also assume that he made no mistakes in the non-extant part of verses five and six, then in the transmission-stream of P46 (within the Alexandrian text-stream), scribes added about one letter’s worth of corruption to these eleven verses about every 12 years. 4r – Acts, with a red headpiece. Chapter-numbers appear in the margin (in red, enclosed at the top and bottom by red lines). Lectionary-notes appear at the ends of chapters, in red. 40v – After the end of Acts 28, there is a brief composition describing the martyrdom of Paul. 61r – Romans, with a red headpiece. 82r – There’s a lot of material in the outer margin; it seems to be a quotation from Basil, added before the manuscript was trimmed. 117v – Note with stichometry for First Timothy (230). Second Timothy. 120r – Note with stichometry for Second Timothy (172). Titus. 121v – Note with stichometry for Titus (97). Philemon. 122r – Note with stichometry for Philemon (37). Hebrews. James, you really should go over your posts more carefully. Your second listed variant in p46 is a dittography--although since you disregard itacism, that doesn't effect your count. Still, your stipulations of error are not very consistent. You say you don't count transpositions or abbreviations, but what is κενη ουκ but an orthographically correct transposition of ου κενη? And what is αλλ’ if not an abbreviation of αλλα? BTW, NA28 reverses NA27 here (THGNT doesn't). And p46 has just αλ. The second listed variant in P46 is not a dittography; it is a recurrence of the same variant that occurred in verse 1, only this time it occurs in verse 2. The transposition of κενη ουκ is not counted as a variant; the variation enters when the K in OUK is lost (otherwise we would have OUK KENH). It's not a /simple/ transposition; there is a loss of a letter as well. One could probably say that all' is an abbreviation of allA but I felt like I should differentiate between the two, because the difference can be discerned when the text is read out loud. NA28 does indeed read ALLA instead of ALL'. And, yes; P46 just has AL in verse 20 before H CARIS. So 384's margin of victory is a little higher. Okay, my bad on the ditto. It's a little clearer now. But I still say the K is only added to the OU because the following letter is now a vowel and it is thus needed. That's not a textual variant, but an orthographic one.